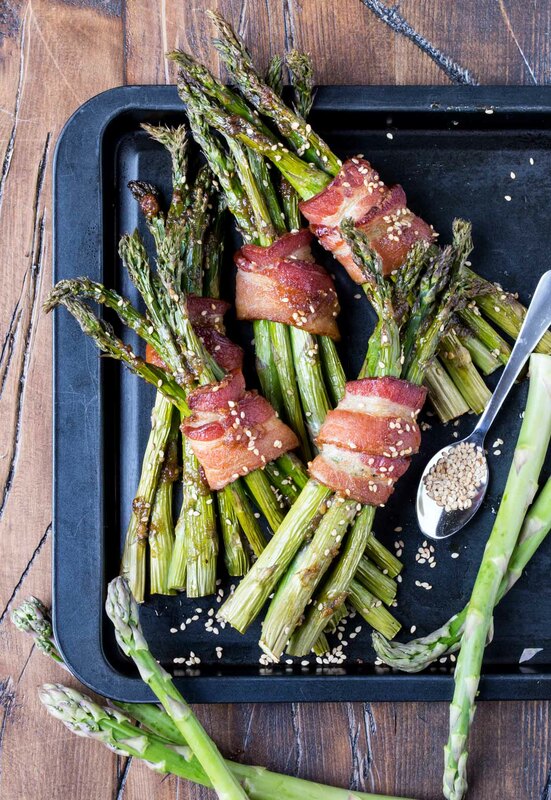 We’d all eat more green vegetables if they tasted as good as this recipe for Bacon Asparagus Bundles! It’s definitely a sign of spring when asparagus starts to appear in stores. And we can think of few, more tasty ways to welcome the change in seasons than these savory Bacon Asparagus Bundles. The asparagus season is brief, so get your fix while you can. 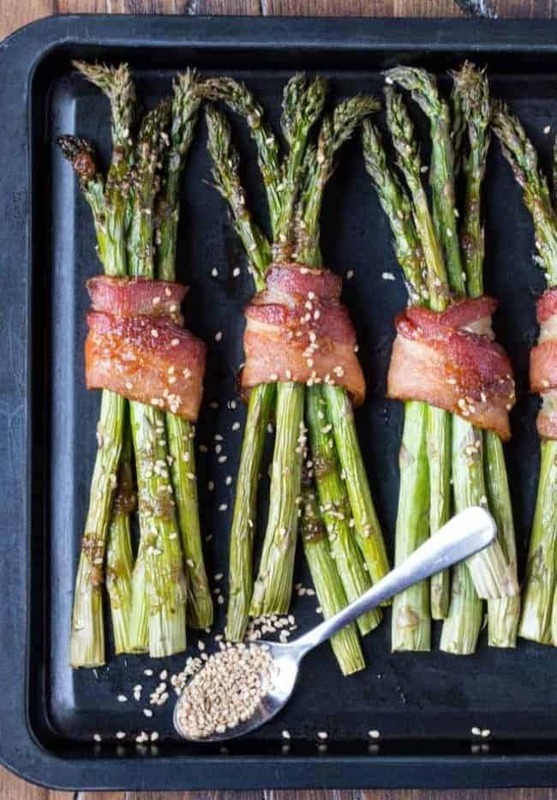 This tasty recipe for Bacon Asparagus Bundles takes a tried and true way of preparing asparagus – roasting – and adds smoky bacon and a hint of sesame flavoring. Plus this recipe is a great use for those thicker asparagus spears that you often find at the stores. The thin spears are ideal for steaming and salads, but the thicker spears actually are well suited for these Bacon Asparagus Bundles because they stand up better to the high temperature and length of time in the oven. The opposite is true for the bacon. As much as we love thick sliced bacon, this is the place for the thinner stuff. If your bacon is too thick, the asparagus may become overcooked before the bacon is properly crisped. I like to place my Bacon Asparagus Bundles on a wire rack on the sheet pan to help the bacon cook more evenly. Fortunately for you, these Bacon Asparagus Bundles look seriously impressive, but they couldn’t be simpler to make. You can wrap the bacon and asparagus together earlier in the day, cover and keep refrigerated until ready to bake. Likewise you can make the sesame mixture in the morning and keep it chilled until you need to slather it on the bundles right before baking. Tip: If you’d prefer to serve these as an appetizer, cut the bacon slices in half and use only one or a few asparagus spears for each slice of bacon. Shorten the cooking time as well. As an appetizer or a side dish, these Bacon Asparagus Bundles are a delicious way to welcome spring! Line a baking sheet with aluminum foil. Spray a wire cooling rack with nonstick spray and place it on the baking sheet. Evenly divide asparagus spears into bunches and wrap a piece of bacon around each bundle. Place bundles on wire rack on baking sheet. Combine olive oil, sesame oil, brown sugar and minced garlic in a small bowl. Slather the sesame dressing over the asparagus bundles. Sprinkle with sesame seeds. Roast for 25-35 minutes or until bacon is crispy. If you have very thin asparagus spears, check for doneness before the recommended roasting time is complete.